The Princeton Varsity Club (PVC) selected a record nine Princeton varsity student-athletes to travel to the Hậu Giang Province in southern Vietnam during the summer of 2018 to participate in the Coach for College program, a global initiative aimed at promoting higher education through sports. 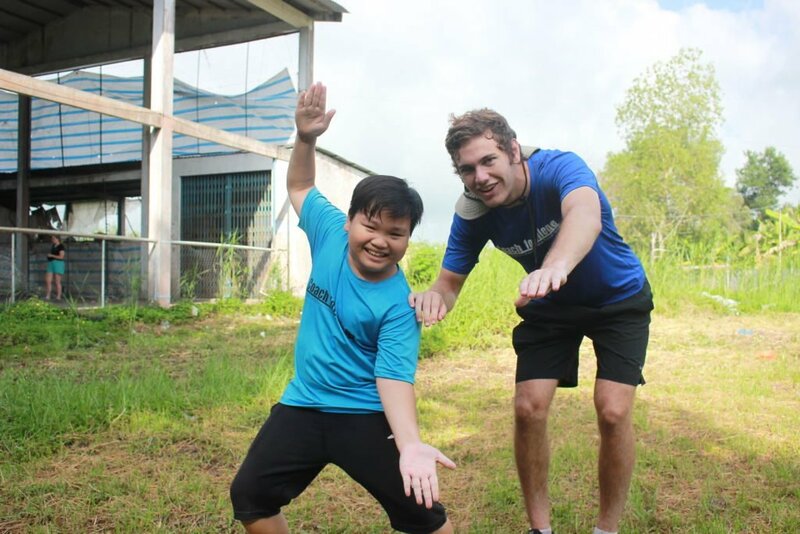 As part of the Coach for College program, the student-athletes taught academics, athletics and life skills to 6th, 7th and 8th grade Vietnamese students while working alongside Vietnamese coaches and instructors. The Princeton Varsity Club provided funding for the majority of the necessary expenses associated with the charitable service trip, with the remainder of the funds being raised by the individual participants. This marks the sixth year the PVC has helped to sponsor international service opportunities for varsity student-athletes. The PVC sat down with each student-athlete to learn more about their educational experience this summer. Our second conversation is with Ben Martin ’20, a member of the Princeton men’s team. For additional photos from Ben’s experience click here. What is the most impactful thing you took away from this experience? The most impactful thing from this experience was connecting with the kids. I never realized how much we (the American College Coaches) would mean to these kids and how attached we would become with these kids. We learned from talking to these kids that many of them do not have parents at home and are living with grandparents, aunts, etc. and it seems they needed a parental figure in their life. I believe we were these parental figures almost and that is why the kids bonded so quickly with us and why we bonded so quickly with the kids. What is your favorite memory of the trip and the Coach for College program? My favorite memory of Coach for College was the last day of teaching. It had rained almost all day the past three days before it so the soccer field I was coaching on was just puddles of mud. And we were just messing around to start because it was early in the morning by just kicking the balls around. Once we started doing that, one of the kids picked up two handfuls of mud and threw them at my partner coach and me. And this started an all out mud war. By the end of it, literally everything was covered in mud. People were jumping and diving in the mud and tackling people in it, it was hilarious. What was your “welcome to Vietnam” moment, where you encountered something you were not expecting or prepared for? My welcome to Vietnam moment was the first night I was there. I had just gotten off the plane after 24+ hour travel day and took a bus to the hotel and realized I was in Vietnam when I couldn’t cross the street there. Unlike our crosswalks and streetlights, you have to just start walking into traffic there and the motorbikes and cars just flow right around you like you are a stick in water. It was surreal at first but by the end it was second nature. The language barrier for the first week was definitely tough. We really relied on our Vietnamese coaches to help translate the first week. After that though, we were able to talk to them much more the second and third week through our body language. We made sure that the lessons were very interactive and we would demonstrate the lessons for the kids. The majority of kids would understand it through our demonstration and the kids themselves would explain it to the kids that didn’t understand as much. What would your advice be to current/future Princeton undergraduates who are considering participating in this program? I would tell them that this a once in a lifetime opportunity. This an opportunity to truly experience a different culture for 3 weeks just for student athletes and for free. Whether it be learning customs, people, and culture in general, I think it is important for people to experience something like this trip while you’re young and in college still because you won’t have the time to do it afterwards. What would be your brief message to those PVC supporters whose generosity and funding helped make this experience available to you and other Princeton student-athletes? I would just like to say thank you so much for your support in sending kids to Vietnam through Coach for College. It was truly one of the most amazing experiences of my life and I am sure other Princeton athletes who have done it will say the same. Getting to know the kids, the Vietnamese coaches, and the other American coaches has taught me so much about what really matters in life and what many of us in America take for granted. What were the most striking differences between your experiences in the US and that of life in the area of Vietnam that you visited? The most striking difference for me was the level of independence the kids had. These kids could’ve survived on their own in the wild, I am convinced. Compared to myself at that age, they are miles ahead of where I was in terms of life skills and working with their hands. What was the most beautiful part of Vietnam? On a physical level, the most beautiful part of Vietnam was the amazing landscape, especially in Southern Vietnam. The rice fields and rivers with lush vegetation were incredible to see. On a different level, the most beautiful part of Vietnam was the happiness I saw in the kids. They genuinely seemed to be trying to live their lives to the fullest. Also, I would say the bond we made with the kids was a beautiful thing because it was so pure. We were like family by the time we left which is crazy to think about since we left after only 3 weeks. Can you briefly outline what a typical day was like as part of the program? A typical day started by waking up at 6:15. We then had a quick breakfast and got ready for the day and left for the school at 6:45. School started at 7 AM for the 8th graders and we’d have 40 minute periods of class and sports. We would do two sports, two academic subjects, and a life skills lesson per day (out of 4 sports and 4 academic subjects). So the 8th grade period ended at 11 AM and then we had a 2 hour break for lunch and to relax. Most of the time these breaks were just spent talking. Then, at 1, we left for the school again to teach 9th grade (which started at 1:15). We would do the same academic/sport schedule (40 minute periods with 2 sports and 2 academics and a life skills lesson per day). Then, we’d go home and have dinner around 5:30/5:45. After dinner, we would have lesson planning for about an hour or so from about 7-8 ish. After that, we would have time to relax and usually play games with the other coaches. Bed time was usually around 10-10:30.